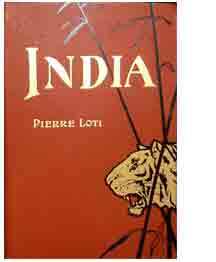 Pierre Loti was a fascinating character -– French naval officer, writer, and traveler to exotic foreign lands. Famous in his day, he went native for a while in Tahiti, had an illicit love affair with a Turkish harem girl in Istanbul, and was elected to the Académie Française. Loti visited India in 1899 and 1900 and was the guest of a maharajah in Ceylon. Quite a life! India, with its fabulous cover, was published around 1910 (exact date not stated by the publisher) and is illustrated with evocative color plates and black-and-white drawings.